The 2014 Ryder Cup Commemorative Banknote Folio Celebrate The 2014 Ryder Cup with the first-ever commemorative banknote issued in honour of The Ryder Cup! The 40th edition of The Ryder Cup returns to Scotland for the second time in its history on September 23 – 28, 2014 and will take place on the Jack Nicklaus-designed PGA Centenary Course at the beautiful Gleneagles Hotel in Perthshire. The 2014 Ryder Cup Commemorative Banknote , issued by Royal Bank of Scotland, celebrates The Ryder Cup’s return to The Home of Golf, and incorporates a host of unique commemorative and security features. The banknote is the first in the UK and Europe to use Hybrid cotton and polyester plastic materials, as well as a see-through window in the shape of The Ryder Cup logo. The reverse of the note combines an image of the iconic Ryder Cup trophy alongside images of The Gleneagles Hotel and the PGA Centenary Course itself. The 2014 Ryder Cup Commemorative Banknote comes beautifully displayed in a special Collector Folio with Certificate of Authenticity and a historical narrative. It contains an original, uncirculated banknote which has been sealed in a protective lens to preserve its pristine condition for future generations. 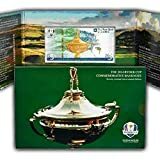 If you love golf, this collectible 2014 Ryder Cup Commemorative Banknote Folio is the ideal keepsake. The 2014 Ryder Cup Commemorative Banknote: •Collector folio•Certificate of authenticity•Historical narrative•Original, uncirculated banknote The Ryder Cup The Ryder Cup has become one of the world’s greatest sporting contests and is full of drama, tension and skill. Millions of people around the globe look forward to this exciting showdown as every two years 24 of the greatest golfers from Europe and the United States go head-to-head.